Missionary scholarship, especially by members of the Society of Jesus, has been tremendously important in the historical reception of East Asian thought in the West. 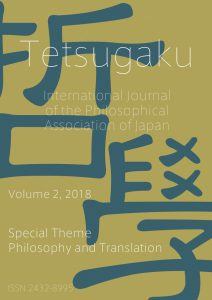 To this day, Christian missionaries are among the most influential transmitters and interpreters of East Asian thought and research on Japanese philosophy, for instance, is more often than not .carried out in religious studies departments and in church-affiliated universities rather than in philosophy departments. And as this book shows, the first sustained intellectual engagement and attempts to think by drawing on both the East Asian and European traditions were by missionaries like Amiot. For better and worse, this historical legacy continues to influence the way Western scholars approach East Asia and its intellectual traditions. Studying the origins of what today travels under the name of comparative philosophy, as Dr Nii has done with this book, is therefore important and she has to be congratulated on her achievement. For more details, including a table of contents, please visit University of Nagoya Press. The dominant use in English of the words “East Asia” as a collective designation for Greater China, the two Koreas, Japan, and sometimes Vietnam is a relatively recent outgrowth of cold war era US scholarship. The previously dominant term “Far East” reflects a Eurocentric worldview, which was politically problematic in Japan and expedient for lesser 19th century European powers and post-war America to avoid. Through the influence of Karl Ritter, the German-speaking world and Scandinavia, like Japan, tended to conceive of the region as “East Asia”, whereas Britain and France thought, spoke and wrote in terms of “Far East”. “East Asia” was thus a counter-hegemonic concept developed on the margins of the colonial world order, which arguably entered post-war Anglograph scholarship through Japanese. Just as Heidegger hinted that his philosophy had Japanese “hidden sources”, the proliferating East Asia discourses today conceptually originated as part of Japan’s modernisation process and rise as the first non-Western great power. It was a disruptive resignification attaching new and positive meanings to the European idea of Asia, rejecting the externally ascribed and objectivating identity of “Far East”, asserting subjectivity and agency. This presentation traces the genealogy of the contemporary idea of East Asia through Karl Ritter’s Ost-Asien, his student Élisée Reclus’ politicised use of Asie orientale, the migration of the Japanese ideas of East Asia (Tō-A 東亜 from the 1880s and Higashi Ajia 東アジア after 1945) from meteorology and geography to political discourse, and from there to the dreaming spires of Harvard.